As such borneol, C10H18O, is found in both optically active modifications, as ester mostly in the laevogyrate modification. Borneo camphor from Dryobanalops Camphora is (d-borneol, Ngai camphor (or Ngai-fen) 1) from Blumea balsamifera consists entirely or in part of lsevogyrate borneol. In addition, (d-borneol has been found in the oils of Siam cardamoms, nutmeg, lavender, rosemary, and spike; l-borneol in the oil from the buds of Pinus maritima, also in the oils of thuja, citronella, Canada snake root, coriander, yellow pine, valerian, kesso root and feverfew. Furthermore the occurence of borneol is reported in a number of oils without mention of the direction of rotation, viz., in larch needle oil, in the oil from the needles and cones of P/cea rubens, in cedar leaf oil, in the oils of ginger, Piper camphoriferum, camphor, cinnamon root, sage, thyme, golden rod, and Achillea nobilis. 1) Report of Schimmel & Co. April 1895, 76; April 1909, 147. As ester borneol occurs in the oils from the leaves and cones (?) of Abies alba, in that of the needles of Picea excelsa, the oil of Pinus montana, in the German and Swedish oils of Pinus sylvestris (? ), in the oil of hemlock leaves, in the oils of the needles and cones of Picea canadensis and P. rubens, in the oils of the needles and twigs of Larix americana, in the oil of the twigs of Abies canadensis, furthermore in the needle oils of Picea nigra, Abies balsamea, Abies sibirica, Larix eu-ropea (?) and Callitris glauca; also in the oils of coriander, Satureja Thymbra, Thymus capitatus, valerian, kesso root and golden rod. As butyrate borneol has been found in valerian oil, and as Isovalerate in valerian oil and kesso root oil. Artificially borneol can be obtained by the reduction of d- or /-camphor by means of sodium in alcoholic solution1) or in in-different solvents.2) However, the borneol thus obtained is never pure since it consists of a mixture of borneol and isoborneol, the latter being probably stereoisomeric with the former. When alcohol is used, less Isoborneol is obtained than when indifferent solvents are employed. In the latter case as much as 5 p. c. camphor pinacone is also formed.3) From the mixture of the two borneols, pure borneol can be obtained by converting it into the acetate or benzoate. Upon cooling, the borneol acetate, respectively benzoate crystallizes out and can be saponified. From pinene (turpentine oil) also borneol can be obtained, either as ester by heating with acids, e. g., benzoic acid, oxalic acid, or by converting the pinene into bornylchloride and subsequent change of this compound into borneol or into camphor and isoborneol (see under camphane). Crystallized from ligroin, pure borneol forms shiny leaflets or plates belonging to the hexagonal system.4) It possesses an odor similar to camphor but also reminding of ambra. It melts at 203 to 204° (preparations containing isoborneol melt at 206 to 208°) and boils at 212°. Like camphor, borneol is volatile at ordinary temperature but not to the same degree as the former. According to Plowman,1) the specific gravity of (d-borneol is 1,011, that of /-borneol 1,02. 1) Wallach, Liebig's Annalen 230 (1885), 225. 2) Beckmann, Bed. Berichte 21 (1888), rep. 321. 3) Beckmann, Journ. f. prakt. Chem. II. 55 (1897), 36. 4) Traube, Journ. f. prakt. Chem. II. 49 (1894), 3. The angle of rotation, as found by Beckmann,2) is -+- 37,44° for (d-borneol. In agreement therewith is the statement by Haller3) who found [a]D +37,63° for an alcohol regenerated from the crystallized acetate. For natural /-borneol, Beckmann found [a]D - 37,74°,2) Haller [a]D - 37,77°.8) A somewhat higher angle of rotation, viz., - 39°25', was observed for the /-borneol known as Ngai-fen.4) The borneol found in most volatile oils is more or less of a racemic mixture. The dextrogyrate and lasvogyrate modifications of borneol behave alike chemically. Although borneol is a saturated alcohol, it forms unstable addition products with bromine and hydrohalogen5) which, however, are not suited for purpose of identification. Hydrohalogens, or better phosphorus halides, also convert borneol into the bornyl halides, which, however, are more satisfactorily prepared from pinene. As a secondary alcohol, borneol upon oxidation is first converted into the corresponding ketone C10H16O, camphor. A change in the direction of rotation is not effected thereby. When stronger or acid oxidizing agents are employed, oxidation products of camphor, viz., camphoric acid, or those of camphene may also be produced. Toward dehydrating agents, such as zinc chloride and dilute sulphuric acid, borneol is very stable.6) In this respect it behaves very differently from the isomeric Isoborneol. When treated with phosphorus penta-chloride it yields bornylchloride which upon boiling with aniline is converted into camphene. Numerous ethers and esters of borneol have been prepared. Some of the latter are crystalline and can be utilized for the identification of the borneol. The formate, acetate, valerate and benzoate are described in the chapter on "Esters". 1) Pharmaceutical Journ. 33 (1874), 711. 2) Liebig's Annalen 260 (1889), 353; Journ. f. prakt. Chem. 11. 55 (1897), 33. 3) Compt. rend. 109 (1889), 30; see also Haller, Compt. rend. 112 (1891), 143, On the influence of solvents on the angle of rotation. 4) Report of Schimmel & Co. April 1895, 76. 5) Wallach, Liebig's Annalen 230 (1885), 226. 6) Bertram and Walbaum, Journ. f. prakt. Chem. H. 49 (1894), 8. By heating borneol with potassium hydroxide to 250 to 280°, Guerbet1) accomplished an almost quantitative direct change to campholic and isocampholic acids. In order to determine the presence of borneol in volatile oils, fraction 205 to 215° is used. Upon cooling borneol not infrequently crystallizes out. For its identification the bornylphenylurethane is prepared with the aid of carbanil. It melts at 138 to 1392) and is optically active in the same direction as the underlying borneol. The acetate melting at 29° can also be used, as well as the addition products of borneol with chloral and bromal. That with chloral melts at 55 to 56 °,3) that with bromal at 105 to 106°.4) Finally, borneol can be oxidized with Beckmann's chromic acid mixture to camphor and the latter identified by means of its oxime which melts at 118 to 119°. Occasionally it is necessary to separate a mixture of borneol and camphor. 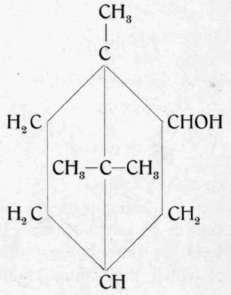 In such a case one can proceed according Haller's5) method whereby the mixture is heated with succinic acid anhydride, thus converting the borneol into its acid succinic acid ester, the sodium salt of which is soluble in water and hence can readily be separated from the camphor. In place of succinic acid anhydride, phthalic acid anhydride can be employed. The benzoic and stearic esters of borneol, which can be obtained by heating with the corresponding acid anhydrides, are difficultly volatile. Hence any camphor can be separated from these by steam distillation. On the other hand, camphor can be converted into its oxime and this be separated from the mixture by shaking with 25 p. c. sulphuric acid. For the quantitative determination of borneol in such a mixture, a very concentrated solution thereof in a suitable solvent (xylene) can be acetylized and the alcohol content ascertained by means of the ester number. If Isoborneol be present, this can be converted into camphene by heating with benzoic acid, benzoic acid anhydride or stearic acid and the borneol regenerated from its ester. By heating for 1/4 to 1/2 hour with a mixture of 20 p. c. sulphuric acid and 80 p. c. methyl alcohol, the isoborneol only1) is converted into the methyl ether. In order to differentiate borneol from isoborneol Tschugaeff's method, based on the behavior of nitric acid toward the two alcohols, is well suited. '2) With pure concentrated nitric acid, borneol develops red vapors, but pure isoborneol never. Oxidizing agents attack borneol more readily. It is also noteworthy that the derivatives of borneol are more difficultly soluble than those of isoborneol. 1) Compt. rend. 147 (1908), 70; 148 (1909), 98. 2) Bertram and Walbaum, Journ. f. prakt. Chem. II. 49 (1894), 5. 3) Haller, Compt. rend. 112 (1891), 145. 4) Minguin, Compt. rend. 116 (1893), 889; Bertram and Walbaum record, loc. cit, 98 to 99°. 5) Compt. rend. 108 (1889), 1308. By treating camphene hydrochloride with milk of lime, Aschan3) prepared a new borneol designated camphene hydrate. It consists of a hard, white crystaline mass that melts at 142° and boils at 205°. The melting point of the sublimed substance is 150 to 151°. The odor is moldy and menthone-like. Characteristic of the new alcohol is the readiness with which it looses water thus regenerating camphene. The loss of water results even when the alcohol is shaken with warm, dilute mineral acids, or when it is boiled with glacial acetic acid, or sometimes even upon distillation.